Early to bed and early to rise makes a man healthy, wealthy, and wise.- Benjamin Franklin Unless you are an early bird, waking up early in the morning is not an easy task, but apparently, it offers countless health benefits. Being up before the rest of the world has its advantages. There are no traffic horns, loud voices, and music, so you can take the time and enjoy the silence and calamity. Relax, and hear your thoughts, admire the morning, and start the day in a positive mood. This will improve your mental health, boost oxygen levels in the brain, lower blood pressure, and relieve a migraine. If you wake up earlier, you will have more time to think and organize the following day. If you are more organized, you will lower stress and be more productive. Such an approach will help you achieve your goals quickly, and prevent the tension that comes due to a tight working schedule. People who wake up earlier are more focused and disciplined and are therefore more productive. These people are cooperative, persistent, and agreeable, have more energy and plan their activities better. Also, they start the day with fewer distractions, their brain is recharged, and they are in a better mood than people who wake up later during the day. The biggest benefit of waking up early is the improved mental health. This habit lowers the risk of depression, mental illnesses, and disorders, and keeps you positive, by expelling negative thoughts from the head. Although it might sound strange, but if you wake up much earlier than usual, will not be groggy. Namely, entering deep-sleep cycles provides restorative benefits, so if you go to bed earlier and rise earlier, lax you will relax the body, lower blood pressure, support the repair of bones and tissues, and boost the blood supply and the release of growth hormones. We are living in a world where everyone rushes somewhere, and we constantly lack time. However, if you wake up earlier, you will be able to prepare your breakfast. It is the most important daily meal, and its skipping leads to numerous negative effects. On the other hand, a healthy breakfast will provide the needed body energy, kick-start the metabolism, improve mood, lower the risk of heart disease and diabetes, and prevent weight gain. Moreover, it will keep you focused, and boost your positive thinking. You will improve the function of your brain if you wake up early in the morning. This will also enhance your critical thinking and problem-solving skills, memory, and concentration, and help you be more creative during the day. If you improve your sleep and wake up early, you will no longer look tired, and it will make you feel and look much better. Moreover, scientists have shown that early risers are likely to have lower body mass indices. People who need to get up early in the morning plant their days better, and have a healthier sleep routine. They tend to sleep and rise at the same time every day, so they boost the quality of sleep, as the internal body clock operates at specific times. For best results, stick to the same bed and wake times even during the weekend, and your body will easily get used to the new routine. If you are still a student, it would be useful to learn that your grades will be much better if you start waking up earlier in the morning. Studies have found that students who wake up earlier get consistently higher grades and have a higher average GPA, since they have better time management, and are able to focus and concentrate better. “We have a natural sleep-wake cycle called circadian rhythm. By being in sync with that rhythm, we can easily improve our sleep. A regular sleep/wake pattern helps you feel refreshed and ready for your day. 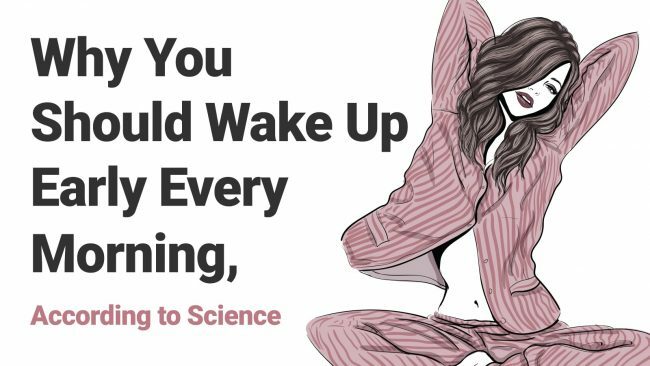 Therefore, numerous scientists stress the importance of waking up early, and even though it can be a bit difficult at the beginning, you will transform your life by improving your sleeping patterns. In a mug, pour the kefir, and add the turmeric. Blend the mixture well, and then add the cinnamon and nutmeg. Sip this amazing relaxing beverage before going to bed. If you decide to warm it, be careful not to boil it, as it will lose its useful probiotics. Yet, heating it will not cause the loss of its natural sleep aids, calcium, and magnesium.